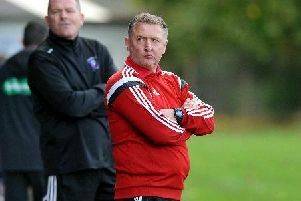 Lanark United recorded an excellent 3-2 home win over Championship side Kilsyth Rangers at Moor Park on Saturday, competing supremely well against a club two leagues above them for the entire game, writes Tam Anderson. 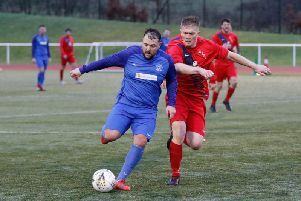 It was an incredible day for United’s Lewis Hill, who netted three penalties in the same match to send Lanark into round three of the Ardagh Group West of Scotland Cup. Yet Kilsyth started well and Lanark keeper Gareth Hallford produced a fine save from Scott Upton after five minutes. On 14 minutes Lanark striker Ian Watt had a good run on the right and worked his way into the visitors’ box where he was brought down for a clear penalty. Lewis Hill scored from the spot to give United an early lead. This lasted until the 24th minute whenkeeper Hallford fouled an attacker at the edge of the box and the referee pointed to the spot. Salim Kouider-Aissa scored with the penalty to level the scores. United’s James Martin then had a good shot which hit the bar on the way over. Into the second period and the game continued at a frantic pace. On 65 minutes Hallford made an unbelievable save when he dived to block a close in header from Kouider-Aissa and knocked the ball up in the air before catching it on the way down. On 75 minutes Joshua Gracie broke on the right and raced into the Kilsyth box where he was brought down for a second penalty to United. Lewis Hill again did the needful to restore United’s lead. But Kilsyth came back to equalise on 79 minutes when Drew Wingate headed in a left wing corner. Wingate, however, was sent off the field on 81 minutes for a two footed tackle on Watt. The winning goal for Lanark came on 84 minutes when Hugh Kerr was held back inside the box as he was about to shoot and the referee awarded Lanark their third penalty. Hill again stepped up and scored with a powerful shot to secure a hat-trick of penalties and complete the scoring. Lanark: Hallford, Gracie, Hill, Haddow, O’Donnell, Annetts, Martin, Fraser, Watt, Kerr, Lafferty. Subs: Anderson, McHugh, Strang, Callan.